Eurostat forecasts that demand for freight transport in Continental Europe will almost triple (182%) between 2010 and 2050. Higher operating costs associated with negative environmental impacts of freight transport - of which most address road (estimated to increase by 40% in 2030 and 80% in 2050) - are putting pressure on companies to adapt their transport modes, supply chains, and fuel sources. Joanna Sinkiewicz, Partner, Head of the Industrial and Logistics Agency, Cushman & Wakefield, adds: “Cushman & Wakefield’s latest publication focuses on an analysis of EMEA transportation corridors and their development prospects in the coming years. Increasing freight volumes, rising costs, road congestion and labour shortages are key factors driving change in addition to the growth of e-commerce and new technologies. Further development of the Central Europe corridor and the Baltic corridor is particularly interesting from our perspective. 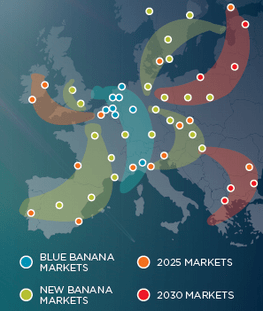 Further significant infrastructure investment is necessary, but Poland – benefiting from its favourable location in the central part of the continent, its competitive labour market and a large consumer market – will remain an important link in the European distribution network. This is also driving directly the rapid growth of the warehouse sector as the rising number of logistics centres is improving supply chain processes of many Polish and international firms for which Poland is becoming an increasingly important distribution hub to service European markets.